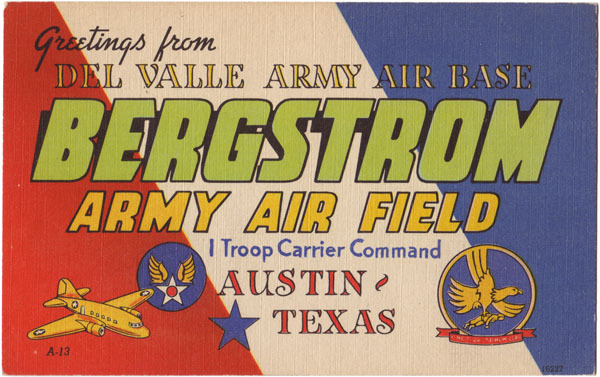 Notes: Originally named Del Valle Airfield (or Del Valle Army Air Base) the name was changed to Bergstrom Army Airfield, in honor of Captain John Bergstrom, the first Austinite killed in WWII, at the suggestion of Lyndon Baines Johnson. The base name was shortened to Bergstrom Field on 11 November 1943. With the establishment of the United States Air Force in September 1947, the base name was changed to Bergstrom Air Force Base on 24 June 1948. On September 30, 1993, Bergstrom was officially closed. That same year voters approved a bond issue for the construction of a new Austin airport at the base.